The one problem with series that tend to create arcs in short volume runs is that inevitably you end up with some downtime on the months in between runs jonesing for a taster to keep you going till the next issue 1 makes its way onto your comic store shelves. Anyone who’s a constant reader of Locke & Key will know what I mean. The same also stands for Action Labs fairy tale fantasy Princeless. With arc 1 having set up the story now we just have to endure till the second arc begins. So, till such time is upon us we have Short Stories for Warrior Women. 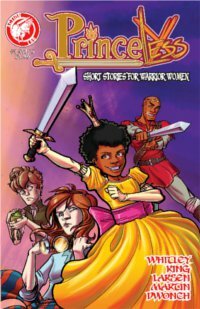 A collection of tales that, while being particularly brief, showcase some fine artistic talents & offer hints at what the future may hold for Adrienne & her siblings as well as a preview of the second volume. First story, The Thing in the Dungeon sees Adrienne & her Brother Devin making a discovery about well… something in the dungeon of their castle. While the title of the story isn’t exactly shrouded in mystery it introduces us to an entirely new character that is & who clearly has a bigger part to play in the issues to come. 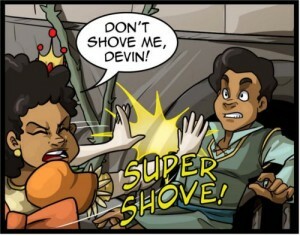 The story also does a bit more to help flesh out the character of Devin, which is no bad thing. Given the short page count Whitley does a fine job of fitting a lot in to the story without it ever feeling over crowded. The real star of this story though is the artwork by Nancy King. Her pencils are lovely & just cutesy enough to lend the characters a sense of childishness, reminding us that this account comes from a time before the main narrative begins, but without being so sweet that they ruin the flavour. It is the colours though that stand out the most in this particular story. Eye catching, bright & just the right side of beautiful King renders Adrienne’s world as a gorgeous blur of technicolour that will leave you feeling utterly enchanted. Quinne Larsen’s art on this story is also beautiful, with some Ligne Claire influences showing through. While the writing is well managed the story feels like it’s over just as it seems to be hitting its stride leaving the reader on something of a cliffhanger. Given that this is the first issue of 2 I can only fathom that we will see the conclusion in the next part. If this means we get to see more of Ms Larsen’s art though I for one won’t complain. Emily Martin’s artwork does the best it can to impress in a short space of time here & for the most part succeeds. The writing also offers a good hint at the challenges Adrienne, Bedelia & Sparky will face in the next arc. While it is impossible to judge based on what is on display here, this little taster will do enough to whet readers appetites for volume 2 is released in the near future. In conclusion Short stories for Warrior Women does its absolute best to hand out a little something to fans awaiting volume 2. However while the art and writing are both of a consistently high standard the complete package is all too brief & will no doubt leave readers wanting more. Not so much a Happy Ever After as it is a Happy For Now, but either way it’s still happy.